Idris Elba’s impressive directorial debut is an adaptation of Victor Headley’s novel Yardie. A hugely successful indie book, sold in hairdressers, clothing shops and nightclubs, it went on to become a cult hit. The book was, at the time (1992), the first populist Black title aimed at a Black British audience, and its impact was profound: as a result of its success, British booksellers finally incorporated “Black writing” sections in their stores. Fast forward to 2018, and Elba’s adaptation offers similar insight into Jamaican-British culture, its roots, and the musical heritage that unpins it, but offers a slightly softer interpretation of the story, allowing its central character more heart and depth than in the book. In Yardie (a patois term referring to people of Jamaican descent), we first see D (short for Dennis) Campbell as a youth (Antwayne Ecclestone) running among the 1970s shanty towns around Kingston, Jamaica, trying to keep up with older brother Jerry Dread (Everaldo Creary), a peace-loving Rasta, who through his reggae sound system tries to bring harmony to Kingston, and reconcile warring gangsters. 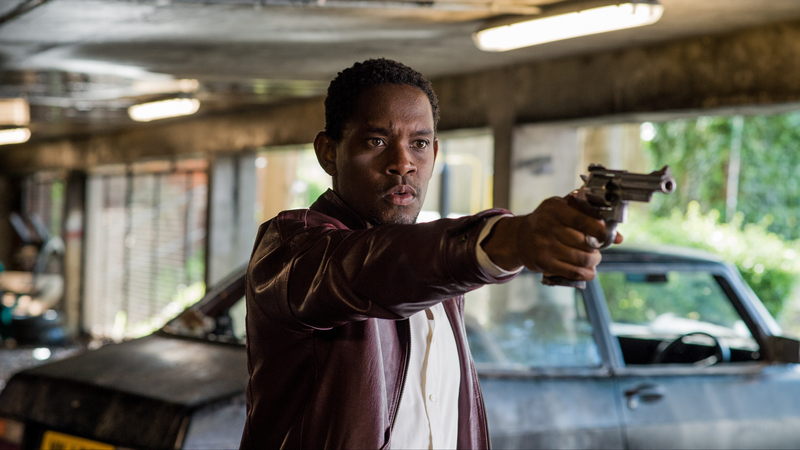 Things turn out badly, and Jerry is killed, and some years later, as a young adult, D (Aml Ameen) ends up becoming a drugs courier for crime lord King Fox (Sheldon Shepherd) – it’s a very different path to the one Jerry tried to steer him on. By now it’s the 1980s and D gets sent by King Fox to London with thousands of pounds’ worth of cocaine taped to his body. He’s supposed to exchange the drugs in a deal with Rico (Stephen Graham) for King Fox, but ends up escaping the meeting and tries to sell the drugs directly himself. Meanwhile, he has hooked up once again with his childhood love Yvonne (Shantol Jackson) and the young daughter he hasn’t seen since they moved to London years ago. He attempts to set up a happy home with them, but he’s also trying to avoid the various criminal factions in East London who’ve put a price on his head, and this inevitably leads to conflict. Amongst all this, D is still haunted by his witnessing his brother’s murder when he was a child, and suspecting he may have stumbled across the killer in London, he seeks violent revenge. Teaming up with a London sound system run by Sticks (Calvin Demba), Arif (Akin Gazi) and Piper (Fraser James), and trying to get rid of the drugs, he seems to finally follow in the steps of his brother by prioritising music over violence, and hopes he can escape the life of crime. There are powerful performances by the cast, particularly Ameen; Idris has a deft hand working with actors, bringing out sharp focus and intensity in them all. Idris also operated the B camera on the shoot, so alongside his own acting career, he’s clearly a polymath. The screenplay by Brock Norman Brock and Martin Stellman brings a great richness to the characters, and this is complemented by the lush cinematography (John Conroy) – from the burnt orange and brown palette of D’s Jamaican home, to the warm reds of his brother’s peace party in Kingston, through to the cool greens of London, and the blues of the dance hall where the sound system clashes take place. Jamaican and Black British culture is brought to life, and alongside the throbbing bass lines of the fantastic soundtrack (including Lord Creator, Yellowman, The Isley Brothers, Culture, Grace Jones, The Roots Radics, The Heptones, and Skip Marley), it’s both refreshing and validating to see this reflected on the big screen. The weak points are a couple of incongruities (for example, a character suddenly appears with no explanation as to who they are, and after saying something apparently meaningful to D, disappears, never to be seen again), and it feels a bit unconvincing that a decade later and thousands of miles away from the murder, D might have stumbled straight on to his brother’s killer, but overall this is a remarkable debut from Elba, and it makes for an engaging, captivating watch.